For embracing the ubiquitous Internet-of-Things (IoT) devices, edge computing and Network Function Virtualization (NFV) have been enabled in branch offices and homes in the form of virtual Customer-Premises Equipment (vCPE). A Service Provider (SP) deploys vCPE instances as Virtual Network Functions (VNFs) on top of generic physical Customer-Premises Equipment (pCPE) to ease administration. Upon a usage surge of IoT devices at a certain part of the network, vCPU, memory, and other resource limitations of a single pCPE node make it difficult to add new services handling the high demand. 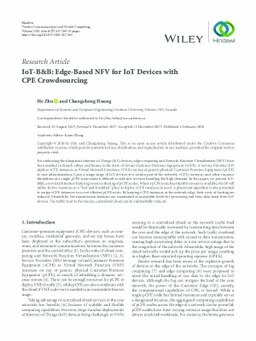 In this paper, we present IoT-B&B, a novel architecture featuring resource sharing of pCPE nodes. When a pCPE node has sharable resources available, the SP will utilize its free resources as a "bed-and-breakfast" place to deploy vCPE instances in need. A placement algorithm is also presented to assign vCPE instances to a cost-efficient pCPE node. By keeping vCPE instances at the network edge, their costs of hosting are reduced. Meanwhile, the transmission latencies are maintained at acceptable levels for processing real-time data burst from IoT devices. The traffic load to the remote, centralized cloud can be substantially reduced.